People across the East Coast shared their earthquake experiences. Overheard on CNN.com: I felt it, too! Less than an hour after a magnitude 5.8 earthquake struck near Washington, more than 10,000 people all over the East Coast posted comments on CNN.com. From Virginia to New York, to Toronto, Canada, the mild quake was far reaching prompting people to share their experiences. 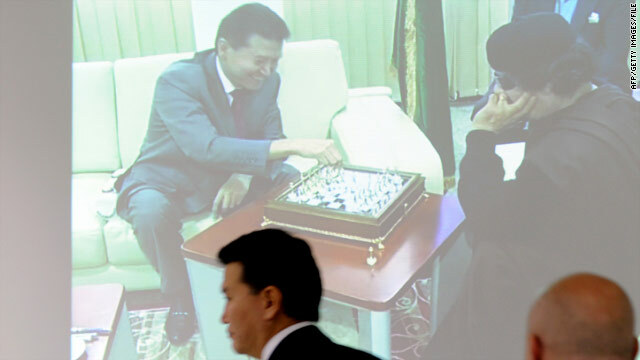 World Chess Federation chief Kirsan Ilyumzhinov, foreground, in June before a screen showing him playing chess with Gadhafi. Rebels declare victory as world wonders, Where on Earth is Moammar Gadhafi? As rebels spread triumphantly through the streets of Tripoli and word of a siege on Moammar Gadhafi's compound is met with jubilation, one glaring question surfaces: Where is Libya's leader of more than four decades? Some rebel officials say a key to true victory - which is already being declared by many rebels and their sympathizers - is the 69-year-old leader's capture. Observers say his future holds only three possible scenarios: capture, death or exile. Despite regular promises to fight to the death in the early days of the rebellion, Gadhafi hasn't been seen publicly since June 12, just two weeks before the International Criminal Court issued arrests warrants for him, one of his sons and a brother-in-law, alleging "crimes against humanity." Officials at the ICC have made clear they want the Gadhafis to stand trial in The Hague, Netherlands, if possible. Gadhafi's June 12 appearance aired on Libyan state television and showed Gadhafi, apparently unfazed by the warfare raging in his homeland, playing chess with World Chess Federation President Kirsan Ilyumzhinov. At the time, Ilyumzhinov quoted Gadhafi as saying he had no intention of leaving Libya. The tune hadn't changed Tuesday when Russia's Interfax news agency caught up with Ilyumzhinov, reporting the chess federation chief had spoken with Gadhafi and his son, Mohammed, by phone and was told the Libyan leader is "alive and well in Tripoli and not going to leave Libya." An earthquake with a preliminary magnitude of 5.9 struck Tuesday afternoon near Washington, D.C., the U.S. Geological Survey said. The epicenter was in Mineral, Virginia. The quake was four miles deep, according to the USGS. Did you feel it? Send CNN an iReport. To get complete coverage and all the latest updates, click on CNN's main story here. View a CNN Open Story about the quake. CNN Open Story combines iReports with reports from CNNers across the globe on a map and timeline. Update 3:36 p.m. ET: Terminal A at Washington Reagan National Airport has been evacuated because of an odor of gas, airport spokeswoman Courtney Mickalonis said. Initial sweeps of the building showed no major damage from the earthquake. Light structural damage has been reported in Culpepper and Orange counties in Virginia, said Laura Southard of the state Emergency Operations Center. She said there have been no reports of injuries in Virginia. Update 3:28 p.m. ET: The White House and adjacent buildings evacuated as a precaution following the earthquake have been given the all-clear, the U.S. Secret Service said. 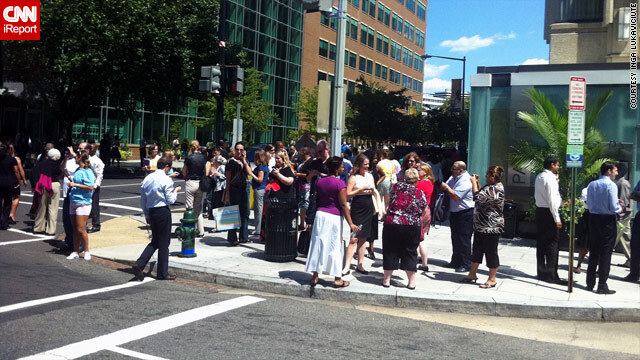 The FBI and Justice Department have also reopened evacuated buildings. Update 3:25 p.m. ET: East Coast residents should be prepared to feel aftershocks from Tuesday's earthquake, a U.S. Geological Survey official said. Update 3:22 p.m. ET: The North Anna nuclear power plant, located 20 miles from the epicenter, is shut down and in a safe condition, a company official and the Louisa County public information office report. There has been no release of nuclear material, Louisa County spokeswoman Amanda Reidelbach said. Update 3:04 p.m. ET: All national monuments and parks in Washington are "stable but closed" following Tuesday's earthquake, a United States Park Police spokesman Sgt. David Schlosser said. A couple of minor injuries and some minor structural damage have been reported in Washington, following Tuesday's earthquake, according to Schlosser. Part of the central tower of the National Cathedral, the highest point in Washington, was damaged, according to spokesman Richard Weinberg. "It looks like three of the pinnacles have broken off the central tower," Weinberg told CNN. Update 3:02 p.m. ET: Amtrak is reporting service disruptions between Washington and Baltimore because of the earthquake, the company reported on Twitter. Aftershocks are a concern, U.S. Geological Survey seismologist Lucy Jones told CNN. "People should be expecting (them), especially over the next hour or two," she said. The quake was felt in Philadelphia, Pennsylvania; New York City and on Martha's Vineyard, Massachusetts, where President Barack Obama is vacationing. It's unknown if the president felt the quake. Cell phone service has been disrupted in New York City, CNN learned within minutes of the quake. A New York judge dismissed sexual assault charges against former International Monetary Fund chief Dominique Strauss Kahn at the prosecutor's request Tuesday. But Judge Michael Obus delayed implementing his order to give attorneys for Strauss-Khan's accuser time to appeal his denial of a request for a special prosecutor in the case. A grand jury indicted Strauss-Kahn in May over allegations he sexually assaulted hotel housekeeper Nafissatou Diallo in his New York hotel suite. In July, prosecutors began to back off the case, asking Obus to release Strauss-Kahn from house arrest after information surfaced that they said called Diallo's credibility into question. New York Judge Michael Obus has accepted the Manhattan district attorney's request for a dismissal of criminal charges against Dominique Strauss-Kahn, the former International Monetary Fund chief who had been accused of sexually assaulting a hotel maid. A precocious kid makes faces behind an unsuspecting Kareen Wynter as she reports on Kim Kardashian’s wedding outside the venue. The video of a child trying to hijack a CNN correspondent's report got us thinking. What other scene stealers are there? You've gotta watch how these children and animals take center stage - sometimes unintentionally. A bomb squad removed a suspicious device from the Jacksonville, Florida, city hall Tuesday, officials said. The building was evacuated while the device was placed into a containment vehicle and safely transported to a sheriff department range, Sheriff John Rutherford said at a news conference Tuesday morning. The device - which had not been confirmed to be a bomb - would be blown apart and examined there, he said. Workers were not allowed back into the building while bomb technicians completed a search for possible secondary devices, Rutherford said. Mayor Alvin Brown said he was not in the building when the device was discovered by a security X-ray machine. City officials said the evacuation would not disrupt preparations for Hurricane Irene, which is forecast to brush by Florida later this week. Toxicology tests have found that "no illegal substances" were in singer Amy Winehouse's system at the time of her death last month, her family said Tuesday. "Results indicate that alcohol was present but it cannot be determined as yet if it played a role in her death," the family said in a written statement, citing test results provided to them by authorities. The 27-year-old singer, beloved for her talent but infamous for erratic public behavior, arrests and drug problems, was found dead at her apartment in London on July 23. An intensifying Hurricane Irene churned northwestward over the tropical waters of the Caribbean Tuesday and is projected to make landfall in the United States this weekend. The five-day forecast map puts the storm on the Carolina coast by Saturday evening, although the National Hurricane Center said predictions this far out can be hundreds of miles off, meaning most of the southeast is potentially at risk. "The Southeast coast of the U.S. will feel some impacts from this storm," meteorologist Wallace Hogsett said. "It's difficult to say whether that will be in terms of big waves or whether it's a more direct impact." Emergency officials in Florida, Georgia and the Carolinas stepped up operations in preparation for the first dangerous storm to threaten the United States in three years. Irene became a Category 2 hurricane Monday evening, with maximum sustained winds of 100 mph. The storm could strengthen to a Category 3, which would make it a major hurricane, forecasters said. "The storm was already stronger than we were forecasting," said John Cangialosi, a specialist with the Miami-based hurricane center. He said Irene, the first hurricane of the 2011 Atlantic season, could even approach Category 4 status as it gathers steam over tropical waters. The president of ratings agency Standard & Poor's, Deven Sharma, is stepping down, the company's parent firm McGraw-Hill Companies said in a statement. The move comes after a tough month for S&P during which it went through with a controversial decision to downgrade the United States' credit rating and revelations of an investigation by the U.S. Justice Department into ratings practices for mortgage-backed securities. Filed under: Business • U.S. The situation in Libya continues to change by the minute. Watch CNN.com Live for the latest developments from the strife-torn country. Tuesday was a turning point for rebels fighting for control of Tripoli, as they seized Libyan leader Moammar Gadhafi’s vast compound. Celebratory gunfire was virtually nonstop as rebels streamed in and out of the compound, many leaving with weapons and ammunition seized from the complex. "We continue to watch for flare-ups from around the country, where there are still going to be pockets of resistance," the official said. "We are also watching the chemical weapons and Scud missiles to make sure they are not used in the endgame." [Updated 10:58 p.m. ET, 4:58 a.m. Wednesday in Libya] In an interview with CNN, former Gadhafi aide Bashir Saleh called for an end to the violence. "I appeal to everybody who has his arms to think before shooting - from our side or from the Gadhafi side. It's time to stop the bloodshed," he said. [Updated 9:19 p.m. ET, 3:19 a.m. Wednesday in Libya] Rebels at Tripoli's airport say Gadhafi loyalists fiercely defended an area east of the airport Tuesday, prompting the rebels to wonder whether loyalists were protecting a high-profile figure in the vicinity, CNN's Arwa Damon reports. Rebels hold the airport but have yet to control an area to the east. Gadhafi loyalists from two military compounds launched multiple assaults on the airport Tuesday, Damon reported. [Updated 9:08 p.m. ET, 3:08 a.m. Wednesday in Libya] Gadhafi spokesman Moussa Ibrahim has told Arrai Television that Libya's tribes have organized a military leadership, and that the tribes will go to Tripoli to fight the rebels. "Moammar Gadhafi's rule is not just over Tripoli," Ibrahim said. "Moammar is loved by millions! From the center of Libya to western Libya to the mountains of Libya to everywhere. So the fighting will continue." [Updated 9:03 p.m. ET, 3:03 a.m. Wednesday in Libya] A Maltese government spokesman told CNN's Matthew Chance that a boat from Malta has docked in a Libyan port, with space aboard for journalists who are inside the Rixos Hotel in Tripoli. "The trouble is that we've not managed to negotiate an exit from the hotel," Chance said early Wednesday. Gadhafi loyalist guards at the hotel have not allowed journalists there to leave, saying they are being protected. [Updated 8:44 p.m. ET, 2:44 a.m. Wednesday in Libya] Gadhafi, in a taped message aired tonight by a Tripoli radio station, vowed martyrdom or victory, according to Reuters. He also said the retreat from his compound, which was taken over by rebels on Tuesday, was a tactical move, according to Reuters. [Updated 8:10 p.m. ET, 2:10 a.m. Wednesday in Libya] About 200 people are celebrating in Tripoli's Green Square - which rebels are calling Martyr's Square - CNN's Sara Sidner reports. 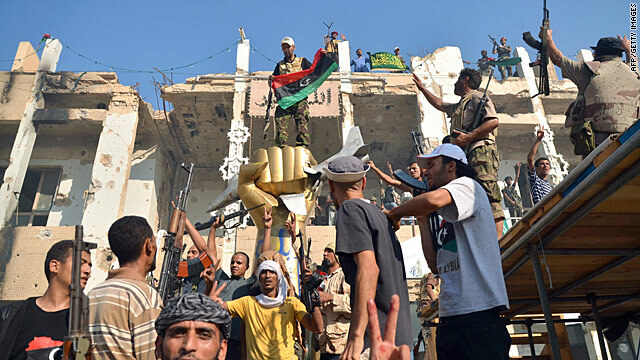 People are firing guns into the air in celebration, waving pre-Gadhafi Libyan flags and shouting things like "Gadhafi needs to go," according to Sidner. [Updated 7:26 p.m. ET, 1:26 a.m. Wednesday in Libya] Some of the rebel leadership is moving from its power base in Benghazi to the nation's capital, Tripoli, said Mahmoud Shammam, information minister of the rebels' National Transitional Council. "Half of the government will be in Tripoli tomorrow morning," he said, citing the ministries of Oil, Communications, Interior, Defense and Health. "They will take care of their jobs immediately." A stabilization team will ensure that Tripoli is supplied with electricity and clean water, Shammam said. [Updated 7:21 p.m. ET, 1:21 a.m. Wednesday in Libya] The information minister of the rebels' National Transitional Council, Mahmoud Shammam, said "it doesn't matter" where Gadhafi is. He said rebel forces controlled 90% of the country. "In a few hours, maximum a few days, we have a new Libya, a new, liberated Libya," he said. Shammam said battles raged in several cities across the country - not just in Tripoli. "We're fighting in three or four fronts right now," he said, adding, "our troops are limited." [Updated 6:52 p.m. ET, 12:52 a.m. Wednesday in Libya] Venezuelan President Hugo Chavez said his country would only recognize a Libyan government led by Moammar Gadhafi, state media reported. "From here we confirm our solidarity with the Libyan people, our brother that is being assaulted and bombed ... as part of the imperial insanity," Chavez said during a meeting of government ministers in Caracas, Venezuela, the state-run AVN news agency reported. Chavez and Gadhafi are close allies. The Venezuelan leader has spoken out numerous times since unrest erupted in Libya, accusing the United States and other countries of blowing the situation out of proportion to justify an invasion. Gadhafi loyalists have not allowed the group to leave the hotel for days, saying they need to stay for their own safety. [Updated 6:14 p.m. ET, 12:14 a.m. Wednesday in Libya] The Rev. Walter Edward Fauntroy, a former congressional delegate for the District of Columbia who is trapped at Tripoli's Rixos Hotel with foreign journalists, has told CNN that he arrived in Libya more than a week ago on a peace mission with fellow minister K.A. Paul. "Right now we are in a precarious situation with some of our friends from the media, because we fear that unless we are able to relocate, we may all be in danger," Fauntroy said. "As a minister who believes in the fervent and effective prayers of the righteous, I have joined with Dr. K.A. Paul in an appeal to people ... to pray for deliverance for not only us, but the press corps with whom we have been quartered here, in an effort to carry out our peace mission." "I came here over a week ago now and have been working on a long term effort to rally the genuine spiritual leaders of the world ... to work out a peace agreement," said Fauntroy, who was an associate of the Rev. Martin Luther King. Gadhafi loyalists have not allowed the journalists to leave the hotel for days, saying they need to stay for their own safety.